It’s very hard for me to write about my dear longtime chaver, Levi. I don’t know where to begin so I would like to focus on our friendship, as this will be a reminder to myself as well as to others, on the importance of staying close. Levi and I practically grew up together: our birthdays were celebrated just a week apart, we were classmates throughout the entire school years, staring from preschool, we spent many summers together - thousands of hours of friendship and conversations. There’s another memory that springs to mind, of one of the so many people that felt so close to you, Levi! I noticed Amy, the guy from your mivtzoyim route standing and crying with everyone else, and it brought back vivid memories. Although we didn't regularly go on mivtzoyim together, you used to schlep me along to farbreing with Amy in his Manhattan apartment a number of times. It’s hard to believe that you were doing this at such a young age! We were farbreinging with someone so much older than us. You really taught me what it means to farbreing with someone, the good feeling that is gained from doing so, by becoming much closer with the other person, and greatly enhancing the relationship. Later, on the way back home to Crown Heights - either on the train or when we took a taxi - you spoke of the geshmak that we had just experienced and how you wish we can do this much more often. This was just the beginning of Levi acting as a shliach! This was something that you enjoyed so much and what you told me many times that it was the most enjoyable part of being on shlichus: farbreinging and becoming friends with new people, and through that being mekarev them, and how that is the best job in the world! 1 - When my younger brothers were born, you came to the Shalom Zochors, although it required special effort. You had to arrange for an older bochur friend (which you had no shortage of!) to walk you over, since your father had a weekly shiur at your house. It meant so much to me that you were celebrating with us. 2 - As a bochur, Levi was on shlichus in Migdal Haemek, and I was on shlichus in Kfar Chabad. Shortly after we arrived, and we were separated from each other for so long, not seeing each other on a regular basis (as we did since we were in Oholei Torah preschool in east Flatbush by Reb Michel’s shul), Levi started calling me regularly, and nudging me: “Nu, when are you coming to Migdal for Shabbos?” Sure enough, I soon went to Migdal for Shabbos, and Levi welcomed me like only Levi knew how. He gave me a grand tour of the yeshiva and the city, and he introduced me to all his new friends – which was the whole yeshiva! I will never forget the Friday night Shabbos meal with the whole yeshiva, where Levi rocked the house like only Levi could do, with tremendous chayus and niggunim, including “The niggun” that he would sing very Friday night. He got everyone involved in singing it, to the point that the bochurim called it Levi's Niggun! In fact, this past Friday, I was listing to a CD of niggunim that his late father, Reb Zalmen A"H had put together. One of the songs he calls “Levi’s Niggun”, and mentions that this is an old niggun that the bochurim from Migdal Haemek would sing when they came over to the Deitsch family during Tishrei. (The generous hospitality in the Deitsch household is legendary, and so many can attest to that-it’s truly admirable!). Indeed, this was the niggun that Levi would always sing and get everyone to sing along with him! On Shabbos day, he took me to eat at the home of Rabbi Hendel, the esteemed Rov of the community, with whom Levi had already established a very friendly relationship. On Motzoei Shabbos we both went out together, and Levi walked me to the bus station. Before I even left the city, Levi was already asking and demanding that I come back to visit again soon. 3 - At my engagement L'chaim and at my kiddush in 770 before my chasunah, Levi was there to bring happiness and joy on my special day. He made sure to say lots of L’chaim and really helped bring a tremendous chayus into the farbreingen that lasted for many hours. Before my chasunah, which was held out of town, Levi insisted that he should be the one to take me to the airport. My other siblings assured him: “Don’t worry, we are going to do it. We B”H have a big family, someone will be available to take him.” He said: “don’t even think of letting someone else take you - I am going to do it!” and so it was. 4 - Shortly after Levi moved on shlichus to Virginia, he started calling and nudging: “Nu, when are you coming to visit with the family? We have to get together, you have to see my place!” After a number of such calls I made the eleven hour drive from Toronto to Virginia to spend two quality days together. We went out together to Washington DC, we visited the neighboring Chabad Houses, and we spent hours just farbreinging together. Whenever Levi was in Toronto, where two of his siblings are shluchim, even if he was there for a short time - coming in and out for a family simchah - he always made it a point on his schedule that we should get together. 5 - Levi made sure to always stay in touch. He never missed to call me on my birthday, even when he was r”l sick, he still called and gave all of his brochas. Last year, he called a day late and he started apologizing for being a day late. I told him that he didn’t have to call altogether, and how delighted I am that he is calling me at all, he certainly didn't have to apologize! He just brushed it off by saying: “a gutte chaver darf men rufen” ["a good friend you have to call"]. 6 - After Levi sadly become ill, I would call him very often. At one point he told me that I should from now on call him or text him on his cell phone, since that is the best way to get hold of him. If he was unable to talk at the moment, he would call me back as soon as he had a chance. After he sadly was not able to see properly, and it was hard for him to call, he would send me a text by just typing a few letters, telling me that that was the sign that I should call him now, that he wants to talk. I have saved on my cell phone many texts that that read like this: axedsssll….. and it will be an everlasting reminder how much he loved to farbreing together and how important it is to call a chaver. As mentioned above, after Levi sadly become ill, we spoke very often. I never asked him about his illness. Whatever he said, he said, I didn't ask more. About two and a half years ago, his brother Nechemia, may he live and be well, made a bris and Levi came in for the bris to be the sandek. We arranged it that if he would come in (he didn’t know until the last second if would be able to come at all), I would pick him up from the airport and we would spend the day together. And with the chayus and strength like only Levi had, with his loud laughs, went on and on being his regular self. I tried (a bit unsuccessfully) holding back my tears and missed the exit on the highway. Meanwhile, the entire time Levi was talking and telling me everything he is going thru and how it will all be fine. He said that no one else in his community knows about it, how he managed to hide it form everyone, and he is continuing with his shlichus like nothing is going on so all the activities with all the people involved wont be affected at all!!!!! Again and again, he told me how it will all be fine. I was sitting and listening, and instead of giving chizuk I was getting such chizuk from Levi himself. This happened almost every time we spoke - he was giving chizuk and lebedikeit, uplifting all of us. This is something that I heard from many people that went to visit Levi and from those that called him; he was the one always giving chiuzuk! We then went out together and had a good time together, by just farbreinging together, which was Levi’s favorite thing to do. 1 - when Levi was in NY to undergo some treatment, two close classmates and myself came by to visit him on Sunday night. 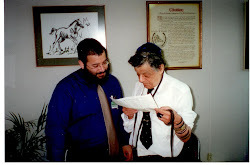 The plan was to go in for a short visit, since I had already visited over Shabbos, and I had to drive back to Toronto, and most importantly he had a doctor appointment on Monday morning. But Levi just didn’t let us go… he said a few more minutes…another story , and another story.... until it was light outside! He then sent me an email thanking me for the “all- nighter” and how much he appreciated it, and how much it meant for him. After that incident, we started learning a sichah on the phone together with a few classmates, something that was done on and off before levi become ill as well. 2 - Shortly after I moved on shlichus to Toronto, I did an unveiling for a person whose son ‘happened’ to live near Tyson’s Corner. I told him that I have a very close friend that lives not too far, and that they should get together. He gave me all of his contact info and I forwarded it on to Levi. B”H they connected very well. The son became involved in the Chabad activities there, he put his kids in Levi's Hebrew School, and become a supporter of Chabad of Tyson’s Corner! On one of my trips to Tyson’s Corner, Levi wanted to go out to the same coffee shop where he first met this person. He wanted to tell me where they sat, to tell me everything they talked about when they just met, and how the family got connected with their Chabad House. He was so thankful for that connection that I made for him, just a simple gesture on my part, yet he kept on thanking me, and mentioned this a number of times when we spoke over the next few years. 4 - Once, after a farbrengen for my birthday (after Levi was not well) and after I had a few L’chaims, I called Levi's cellphone. It was around 3 AM, and I left this long message with some brochas. I don’t remember exactly what I said, but he called me the next day thanking me, saying how happy it made him feel and how he saved the message to listen to again and again, and how he wished that I did it more often. 1 - As a child, he would bring lots of cake to school to share with us. He would say that he has to know how it tastes, as his mother - may she live and be well - needs to get some feedback, as she was in the midst of working on the Lubavitch ‘Spice & Spirit’ cookbook, and needs to know if she should include that particular recipe. 2 - Levi shared with me on a number of occasions that he had helped out various shluchim financially, simply loaning large amounts of money. Some were our classmates, others were older shluchim, who despite the great age difference were Levi’s friends. At times, I would ask him about his connection to that particular shlaich that he just gave such a big loan to. Levi would always say: “if the Rebbe’s shliach needs help, and I can help, I will do whatever I can.” And he did! 3 - A number of our classmates and friends are on shlichus or have jobs, thanks for Levi putting in a good word for them. Whether it was through making the phone calls on their behalf, having other chaverim call, and making follow-up calls once they were at their new job; Levi was a truly devoted and caring friend! Also, there are many people that are married today, thanks for Levi’s input in making their shidduch (directly or indirectly). Levi started this even when he was still a young bochur, caring about others and their futures, assisting his mother in this important work. Levi was very proud of the hatzlacha of his siblings and friends on shlichus. Levi would describe with tremendous nachas and joy about their Chabad Houses, their breitkiet, the stories that happened to them etc. He listened to a CD from a dinner that was produced by another chaver on shlichus. He said how they talk so highly about our chaver: "It’s unbelievable, you must get it and listen to it!" The same nachas was heard in his voice when he was describing so many of our friends and their success in business. He did it with such sincere happiness, as he would go on and on in describing their successes. Dear Levi, thanks for your friendship!!!!!! No one will ever be able to take your place as a true friend, the one who always put a smile on my face. There is no one else that I spent so much time talking on the phone with, on such a regular basis. No one was ever as concerned about every detail of my personal and shlichus life as you were! Levi, I had to stop typing so many times because I can’t stop crying ……your loss is so great! Levi, you taught me a big lesson in life. Pick up the phone and call a chaver, a long-lost classmate. Keep in touch. You showed me how much it meant to you, and how much it means to everyone - to have the feeling that someone is thinking of them! Dear Levi, I never told you this, but thanks to your living example, I had started calling more chaverim over these last few years, to wish them happy birthday, or just to stay hello. I hope that this trend will only catch on to more and more people. Surely, in the zechus of your incredible Ahavas Yisrael that is now serving as an example and inspiration to so many people, it will bring all the necessary brochas to all your loved ones-to your dear wife Miriam , a true Aishes Chayil, to your teiere kinderlach, to your mother and to all your siblings; and may we be zoicheh very soon to be all together and farbreing by the ultimate farbreingen that we’re all yearning to attend - with the Rebbe in Yerushalayim - may it be NOW!!! searching for a similar subject, your web site got here up, it looks great. Hello there, just was alert to your blog via Google, and found that it is truly informative. I am gonna be careful for brussels. I will appreciate in case you continue this in future. Many other folks can be benefited out of your writing. Cheers! If any one of the Live Net TV APK channels that you searched for on Live Net Get Info Tv is not available do not fret you can ask for that channel to Live Net Tv Live NetTV for Android application.